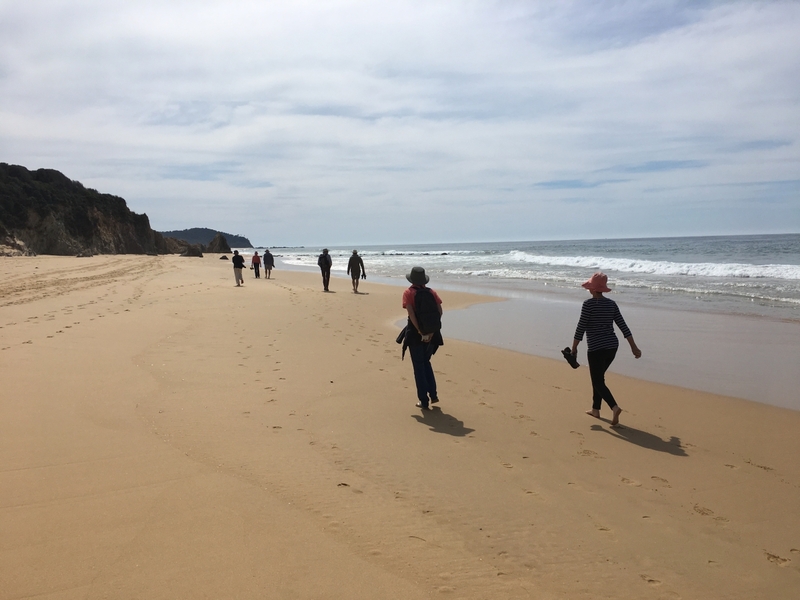 A party of 11 walkers met at the picnic area of Gillards Beach on Sunday 23 September to do a short walk to Middle Beach via Middle Lagoon, with a return along the beach. The weather was fine – sunny but with a bit of cloud cover. After meeting at 11am, and after some morning tea, we began the walk which starts from the picnic area at the northern end of Gillards Beach camping area and leads through beautiful coastal bushland featuring the ancient Burrawangs – a cycad that grows abundantly on the south coast of NSW. It is a flat sandy track which winds through a diverse range of vegetation to the shore of Middle Lagoon, and then on to the camping area of Middle Beach. The walk shows the natural beauty of the region and has a great lookout on a headland, with views of the coastline to the north and south, and over the ocean where we stopped to see if there were any whales around on their southern migration. From there, the track heads down towards Middle Lagoon where we saw the tracks of waterbirds and kangaroos in the sand. A bit further along, we had a great view of a very big group of black swans on the tranquil waters of the lagoon. Other birdlife seen included a sea eagle sailing overhead. Once at Middle Beach, some of the party headed to a sign indicating tracks further north and it was decided to add an extension to the original walk and walk to Stinky Bay which was only about 400 metres further on. Stinky Bay was a narrow bay of rocks and pebbles where we had a short snack before heading back to Middle Beach. A lovely sight was a group of kangaroos on the beach as we descended the steps. By now the weather was changing – very windy and cool – as we headed back to Gillards along the beach, keeping a lookout for whales. A couple of spouts were seen as well as some dolphins in the waves on the walk back, but it wasn’t until we had reached Gillards that a few of the party saw a whale breeching. We were back at the picnic area by lunchtime, and after a quick lunch in the wind, everyone departed.